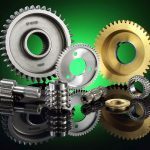 In this article we report on a new product, NanoLub, which is used as a performance-enhancing additive to gear lubricants for extended lifetimes, lower operating costs, and improved power efficiency. The product is based on inorganic WS2 fullerene-like nanoparticles (IF-WS2) formulated either as an oil concentrate or paste, and has been developed to improve the lubrication properties of oils and greases by decreasing friction and wear. 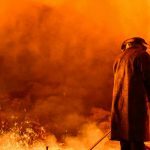 Numerous laboratory investigations and industrial experience indicate that using NanoLub has significant advantages compared to conventional solid lubricants in both mild and extreme pressure conditions. 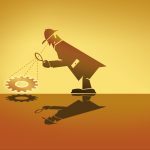 The increased interest in nanotechnology appeared at the end of the 20th century based on significant alteration of the fundamental physical and chemical properties of conventional materials with reduction of their size to the nano-scale. 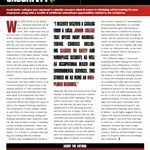 Such new materials expand the field of applications of similar macro-sized forms of the same composition, opening new possibilities and making old products better. The nano-scale particles, due to their greatly reduced size, exhibit properties that are not obtainable with larger grains. Tungsten disulfide (WS2) and molybdenum disulfide (MoS2) are well-known solid lubricants that are very similar in their properties, and they naturally appear in the shape of platelets 1-15 microns in size. 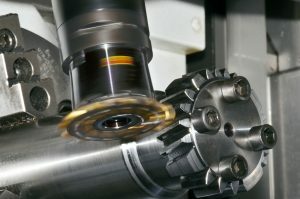 Their tribological properties are based on their layered structure, whereby friction is reduced by a mechanism based on the sliding action between alternating molybdenum or tungsten sulfide layers that exist in the interface of rubbing surfaces. The edges of these flat platelets are chemically reactive because of dangling chemical bonds of the atoms at the exposed margins. 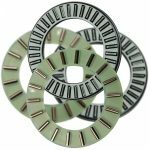 Their large micron sizes and flat shape means that they do not work well on rough surfaces, are ineffective for precision and miniature machined parts, and cannot be used effectively to impregnate powder into porous metal parts. 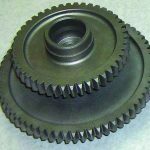 The reactive edges cause them to slowly decompose under high-friction conditions, at elevated temperatures, and in high humidity. 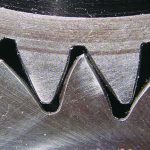 The edges sometimes cause them to bind to the metal surface or to stand on their edge, thereby diminishing their lubricating ability. 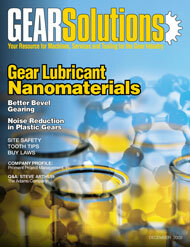 Thus there is a clear need for smaller, curved, and chemically more-stable solid lubricants. Inorganic fullerene-like (IF) nanoparticles satisfy these requirements. IF-WS2 was first synthesized in 1992 at the Weizmann Institute of Science1 (WIS) and first scaled up to ton quantities on an exclusive basis by NanoMaterials, Ltd., starting in 2002. IF-WS2 is commercially superior to the IF-MoS2. Contrary to conventional platelets, these nanoparticles are of a semi-spherical (curved) shape and several orders of magnitude smaller being as small as 30-350 nanometers in diameter (see Figure 1). At this size one can place about one thousand of these nanoparticles across the width of a single human hair. Keeping the layered structure of their platelet predecessors, the IF nanoparticles have curved their layers into an onion-like concentric sphere. One can also think of this as a Russian doll, where each sphere contains a smaller one within itself. A typical IF onion may contain 20-100 such concentric spheres. The mechanism of friction and wear reduction is based on four effects: 1) nano-size particles enable ideal covering of the surface, including roughness irregularities of any size and enable an impregnation procedure; 2) the spherical shape allows for rolling friction instead of sliding as with the platelets; 3) particles in the shape of spheres have no dangling bonds, and are therefore chemically inert; and 4) layers of IF-WS2 undergo gradual exfoliation at extreme pressures, creating nano-size mono-layer fragments. 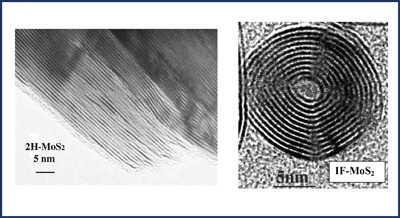 The exfoliated mono-layers of WS2 form thin films on the friction surface (Figure 2), which serve to protect the metal surfaces from oxidation, friction, and wear. • Increases the interval between oil and grease changes. NanoMaterials expends its main efforts today in synthesizing nano-powders of IF-WS2 and formulating them into lube additives as concentrates for oils and pastes for greases. 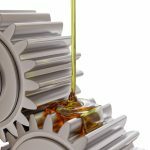 These concentrates are added to the engine or gear oil, or to the based grease at treat rates that achieve 0.5-5 percent of powder in the final oil or grease suitable for direct use. Synthesis of the powder occurs in a specially constructed fluidized bed reactor. The reaction occurs at high temperature in the reduction atmosphere of H2S and H2. Tungsten oxide (WO3) is used as a precursor for this reaction. 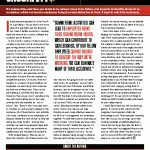 The reaction conditions were optimized during scaling up of this process by NanoMaterials. The produced IF-WS2 powder is checked by electron microscopes (TEM & SEM) for validating shape and size of the particles, and by x-ray diffractometer (XRD) for making sure that complete conversion of oxide to sulfide took place. The tribological properties of the oils and greases mixed with NanoLub were investigated in the NanoMaterials laboratory and by independent parties using a number of standard tribological tests. Among them: Brugger, Timken, Four Ball device, different kinds of friction tribometers (Ball on Disk, Block on Ring, and Reciprocating Ball on Plate). Physical properties of the grease were tested by a Grease Penetrometer, and standard protocols for evaluating corrosion resistance were employed. 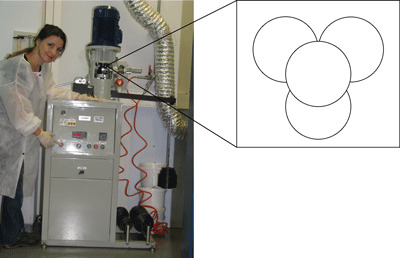 The Four Ball test machine (Figure 3) consists of a rotating ball that glides under selected loads on three fixed balls. This machine is used for two different tests, with the first being ASTM 2596 for Extreme Pressure Properties. Here the test force is increased at defined steps until a load is reached that welds the four balls together or a maximum load is reached (usually 800 kg). The duration of the test at each load is ten seconds, and the higher the load at which welding occurs, the better the lubricating properties of grease or oil are. Secondly, ASTM 2266 for Wear Preventive Characteristics of Lubricant. The test force is constant, relatively low, and applied for 60 minutes. No welding occurs in this test, but rather a scar diameter serves as a characteristic of the lubricant. 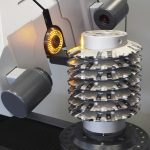 The Timken (see Figure 4) machine utilizes a rotating test ring at variable speeds against a stationary test block. Variable loading is applied through a lever arm to the test block. A lubricating fluid may be recirculated through the test area at ambient or elevated temperature. Grease may be fed through the contact area at ambient temperature. 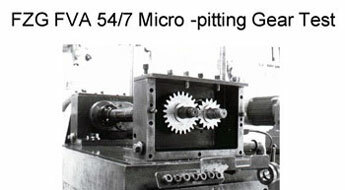 A Brugger (not shown, but similar to Timken) machine consists of a test ring and a test cylinder. The cylinder presses with a force of 400N on the rotating test ring, which is immersed in oil or grease. The speed of the test ring is 960 rpm. The load capability is determined through the quotient of the force and the dimension of the wear mark on the cylinder. Tribometers (not shown) allow direct measurement of friction force, which together with known load gives the data for the coefficient of friction calculation. Different kinds of movements may be employed based on the geometry of the contacting parts: Ball Revolutions on Disk, Block on Rotating Ring, and Reciprocating Ball on Plate. These variations give a possibility to simulate different friction conditions in the laboratory. 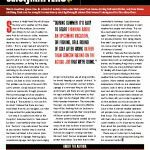 It should be noted that NanoLub was found to be non-toxic and safe. Tested by independent certified laboratories and according to the international OECD protocols, NanoLub was shown to meet or surpass safety and health regulations: acute oral toxicity tests— non-toxic, dermal sensitization tests—none; and acute inhalation toxicity—surpasses standard. 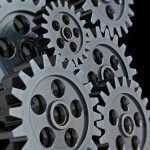 Some of the results obtained during extensive investigations of NanoLub performance as a solid additive in different gear oils and greases in a variety of labs are presented as follows. 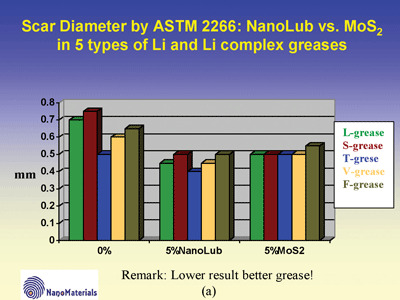 First, Figure 5 shows significant benefits in using NanoLub as a solid lubricant. 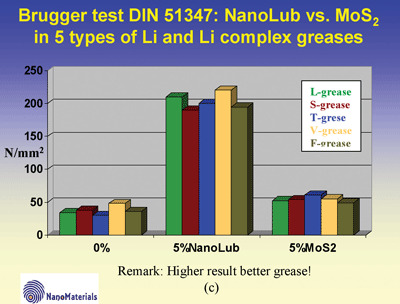 The NanoLub was added in five different Li and Li complex greases, and their performance was compared to pure lubricants and lubricants treated with MoS2 platelets. Three tests were carried out for each formulation: Four Ball ASTM 2596; Four Ball ASTM 2266; and Brugger DIN 51347. 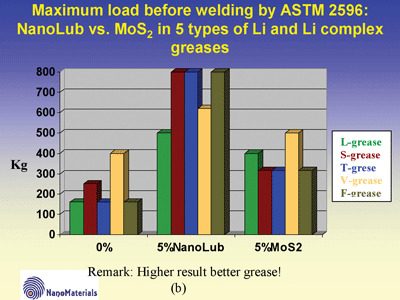 In the Four Ball ASTM 2596 tests, for example, one could observe that a welding point increased from 150-400 kg (for pure grease) to 300-500 kg obtained for grease mixed with MoS2, and to 500-800 kg obtained for grease mixed with NanoLub. Secondly, Figure 5b initial results of using NanoLub in Litol-24 grease in a food oil production plant for different kinds of pressing machines show that: sliding was improved so that bearings do not run hot by speed rotation of 3000 rpm, and the maintenance interval was extended to five months, which is a vast improvement compared to the conventional lube which needed to be replaced every month. 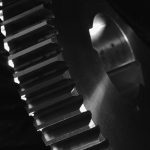 • NanoLub reduces gear wear five-to-six times, therefore the operational life of steel samples can be significantly increased by using IF-WS2. • The specimens tested in the lubricant mixed with 5 percent NanoLub show almost no damage unlike those with base oil alone. 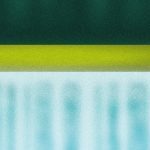 • A beneficial tribofilm formed on the surface. This film serves to reduce frictional forces and protect the steel surface from oxidation and wear. It was found that the influence of this tribofilm continues even after changing the lubricant to one without nanoparticles. These wear tests were carried out in Newcastle using a double disc rig with specimens manufactured from S156 steel, and performed rolling/sliding motion such as gears (Figure 6). 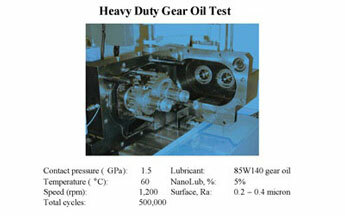 The lubricants tested were heavy-duty gear oil 85W140 without IF-WS2 and 85W140 mixed with 5 percent IF-WS2. The type of failure on the specimens was predominantly micropitting. 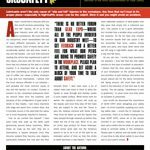 The average micropitting area measured after 5·105 cycles was less than 2 percent on the sample tested in the lubricant with IF-WS2 compared to 10 percent on the sample tested in the lubricant without nanoparticles. • NanoLub significantly decreased damage, making it excellent for enhancing automotive and industrial gear oils. 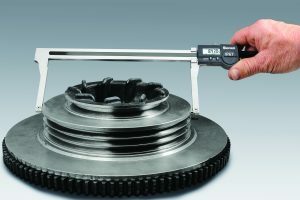 • Failure Load Stage > 10: NanoLub surpasses the FVA 54/7 micropitting test required by most leading gearbox manufacturers. 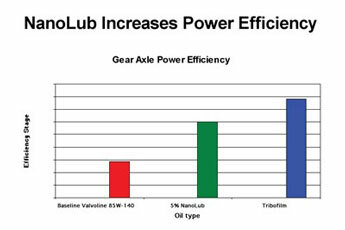 Finally, the influence of NanoLub on gear axle power efficiency was studied in beta site tests by a major F-1 race team (Figure 8). 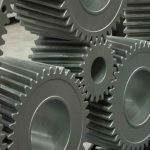 A significant improvement in gear power efficiency was obtained due to the formation of a tenacious protective tribofilm created from the exfoliated shells of the IF multi-walled nanospheres. 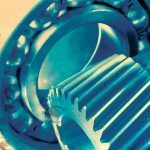 The results show that significant increases in the operational life of rolling/sliding components (engines, gears, etc.) can be achieved by using lubricants incorporating inorganic fullerene-like materials in specially chosen formulations. This conclusion was reached according to the different laboratory and industrial tests that examined wear, load bearing capability, and coefficient of friction. 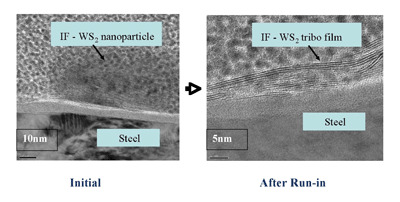 The successful performance achieved with the lubricant containing IF-WS2 is due to their nano-size, spherical shape, and tribofilm obtained on the running surfaces. 1) R. Tenne, L. Margulis, M. Genut, G. Hodes, Polyhedral and cylindrical structures of tungsten disulphide, Nature, 1992, 360: 444-446.